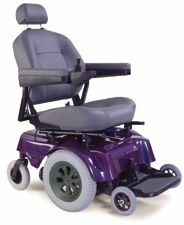 The Merits MP3R Travel Ease Power Chair - This rear wheel drive power wheelchair offers superior traction and maneuverability in a heavy duty wheelchair. 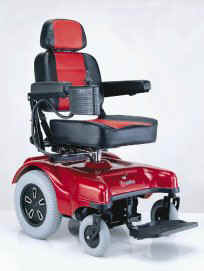 Some of the features include an optional power seat lift, standard semi-reclining back and optional elevating leg rests. With a 300 lb weight capacity, the Merits Travel Ease is the heavy duty chair of choice for superior indoor maneuverability and the ability to handle rough terrain outdoors. Seat Height 22.5" to 26.5"
Programmable controller with proportional speed control. Adjustable height and width arm rests.